Facebook, the world’s biggest social network, is getting considerably bigger. How big, you might ask. 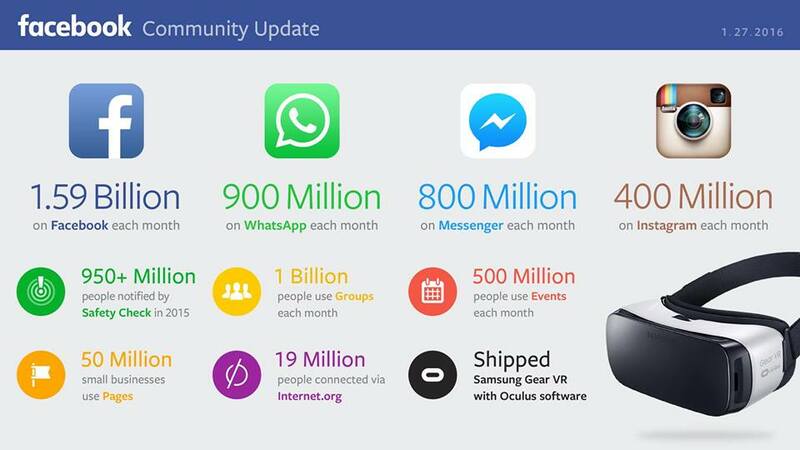 More than 1.59 billion people are active on Facebook each month. There are 900 million users of WhatsApp. Facebook Messenger is used by 800 million people. Instagram, another Facebook brand, is used by 400 million users monthly. More than 19 million people get Internet access via the subsidizing offered via Internet.org. For the full stats on Facebook, just take a look at this infographic below.